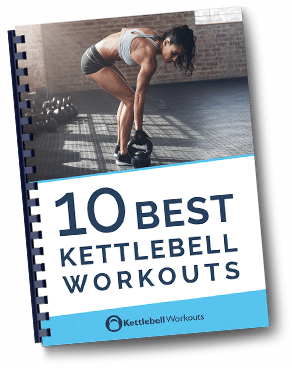 The Kettlebell Deadlift offers the perfect introduction into Kettlebell lifting and is the foundational movement that many of the more famous moves like the Swing and the Clean are built upon. The Kettlebell Deadlift activates most muscles in the body and relies on the posterior chain consisting of the Glutes, Hamstrings and Back Extensors. The main reason for practicing this exercise before exercises like the Kettlebell Swing is because motor control, mobility and correct muscle activation must all work together in order to maximize effective movement and minimalize the risk of injury. The deadlift movement pattern uses a lot of muscles. It is the big hitter of movements and fundamentally helps us lift heavy objects from the floor using the power of the legs, buttocks, back, and core muscles. As you lift from the floor you are pulling the weight up using the power of the Glutes and Hamstrings while keeping the back in an isometric position with the strength of your core muscles. In an age where we spend a lot of time sitting and leaning forwards the Deadlift helps counteract this posture and pull everything backwards, opening up the chest and shoulders. There are very few other exercises that use as many large and energy expensive muscles as the deadlift. The more muscle mass you can use when you exercise the more energy (or calories) are required to fuel that movement. The kettlebell deadlift focuses on movement from the hips while keeping a flat and isometrically (statically) maintained lower back. 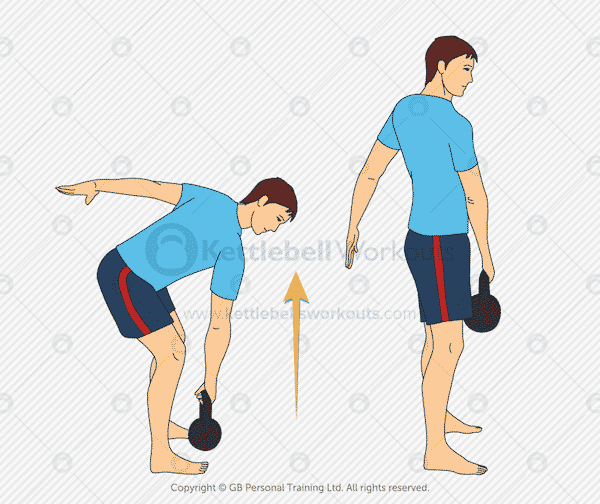 One of the biggest problems with the kettlebell deadlift along with other hip hinge based exercises, like the kettlebell swing, is that the movement often comes from the lower back rather than the hips. Consistent lifting by hinging at the lower back will ultimately lead to serious back injuries. So it is important to learn to hinge at the hips and NOT at the lower back. In order to fully activate the muscles at the back of the body ensure that your body weight is more centered over your heels rather than your toes. Keep your chest up and lower back flat as you hinge over and pick up the kettlebell. The depth at which you can reach down to the floor will be determined by your Hamstring flexibility. 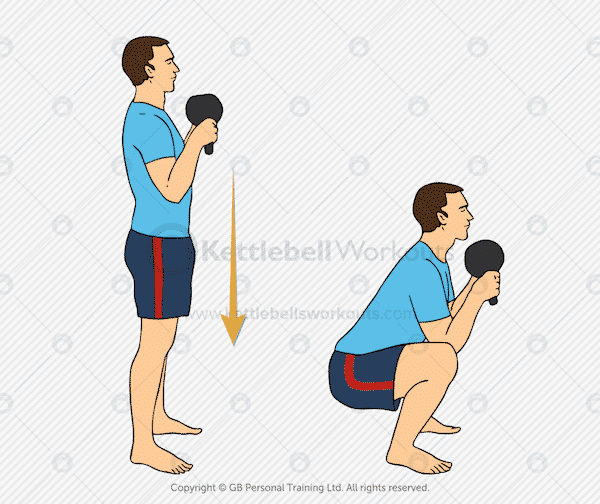 The knees should bend as you reach down to pick up the kettlebell but the hips should be forced backwards with the weight on the outside of the feet and onto the heels. By concentrating on the distribution of weight over your feet you will feel the activation up and into your Glutes (buttocks). Keep you shoulders down and back, the hand not doing the lifting can be tucked out of harms way behind the back. Don’t lift with your shoulders and keep your shoulders well away from your ears. Keep a good grip on the kettlebell to help correctly activate your shoulder stabilizers. As you pick the kettlebell up from the bottom position drive forwards with your hips using your hip extensors (buttocks and hamstrings). Think about snapping the hips forwards with power rather than slowly standing up, this will prepare you for the hip snap used during the kettlebell swing. You can practice the Kettlebell Deadlift with various weights, ironically many people find using a heavier weight enables them to better feel the Glutes and Hamstrings working and forces better activation through the lower half of the body. The beginners deadlift variation that uses both hands on the kettlebell. Great for learning the basic hip hinge movement and conditioning the legs, hips and glutes. Once the Sumo Deadlift technique has been mastered you can increase the depth of the movement and increase the demands on the legs and glutes by lifting deeper. Use two boxes, one under each foot with a gap in between for the kettlebell to be lowered closer to the floor. Careful that you do not compromise your back during this movement if you have tight hamstrings. Lifting the kettlebell from the side rather than between your legs puts additional demands onto your core stabilisers. In effect the Suitcase Deadlift is a dynamic side plank so excellent for working into the side of the body. 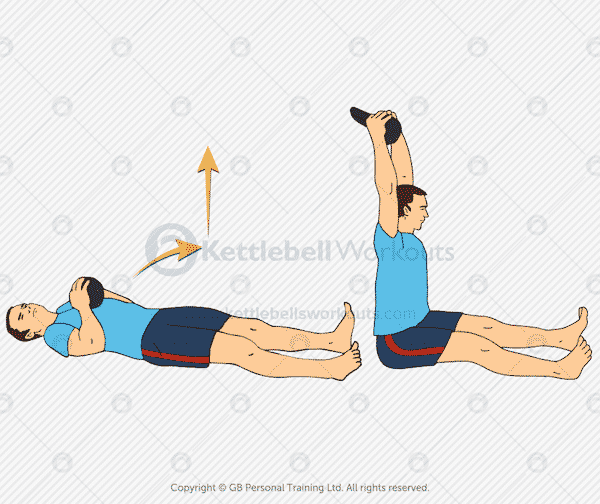 Using two kettlebells for the suitcase row does increase the demands on the legs and buttocks but it also reduces the core stabilisation that you get with the one handed variation. You can overcome this by holding different sized kettlebells in each hand. The single handed deadlift is pulled from between the legs which naturally puts the torso into a slight rotation and increases cross body core activation. If you start to snap your hips though at the top of this exercise it is also great preparation for the kettlebell swing. If you want to learn to connect the top of the body to the bottom via the core muscles then this is the exercise for you. You will need good balance and core strength in order to complete this exercise correctly. A weak side will be replicated in your Turkish Get Up too so spend time working on improving your weaker side. To gain real strength using kettlebells and the deadlift you can perform the single leg deadlift with two kettlebells but on one leg. It is possible to really overload the one leg with this exercise and is great for more athletic strength. Benefits – a great beginner workout that teaches the basic deadlift movement pattern. The slingshot movement is added as active recovery so the kettlebell is not put down between circuits and the heart rate is kept up. Variations – the slingshot can be substituted for halos, hip rotations, upper body rotations or just standard rest if the deadlifts are very demanding. Benefits – this workout adds in a little extra core conditioning. Again great for the beginner who is improving their core stabilisation and looking to get strong on their hands for push ups etc. Variations – the shoulder taps can be replaced with Push Ups, Cross Body Mountain climbers or regular front planks. Benefits – the demands on the lower body and especially the Quads are increased for this workout. The addition of the squats also means a greater cardio workout. Great for the beginner just learning the basic squat movement. Variations – the Squats can have weight added so Goblet Squats or Racked Squats. At this stage the Sumo Deadlift can also be perform standing across two boxes so the kettlebell drops lower than the feet. Benefits – time to increase the tempo and get a little rotation across the body. A good blend of core and cardio in this workout. Variations – the core exercise (slow mountain climbers) can be changed for front planks, side planks or cross body mountain climbers. Benefits – a cardio based workout that keeps the heart rate up throughout. The tempo of the deadlifts should be slightly increased for this workout. Variations – swap out the Fast Mountain Climbers for Squat Thrusts or even Burpees, if you are at that level. Benefits – this workout combines both cardio and core. The side plank hits the core in a totally different direction than the deadlift so a great combination. Variations – if the side plank is too easy or too difficult then you can modify the time. The ultimate goal is 75 seconds! Benefits – great workout for stabilisation, the suitcase deadlift is like a dynamic side plank so excellent for the core. The goblet squat adds a little extra load onto the legs and buttocks. Variations – if your squat is strong then you can progress to the static or dynamic lunge with or without a kettlebell. Benefits – both cardio and core are worked hard during this workout. The suitcase deadlift works on the core muscles at the side of the body and the squat thrust on the front. Add in the extra cardio and strength benefits and it’s a great workout all around. Variations – switch the Squat thrusts for Burpees or Fast Mountain Climbers. Benefits – using two kettlebells means that you can dramatically increase the demands on legs and buttocks. The T-Push Up adds some rotation into the workout that is lost from using two kettlebells. Variations – try using different weights in the left and right hand, this will add further stabilisation demands and improve core strength. Benefits – strengthens the sling system that runs from shoulder to opposite hip via the core muscles. This workout will highlight core weaknesses, if so more time should be spent on the weaker side. Benefits – allows you to really load the one leg by effectively doubling the load. 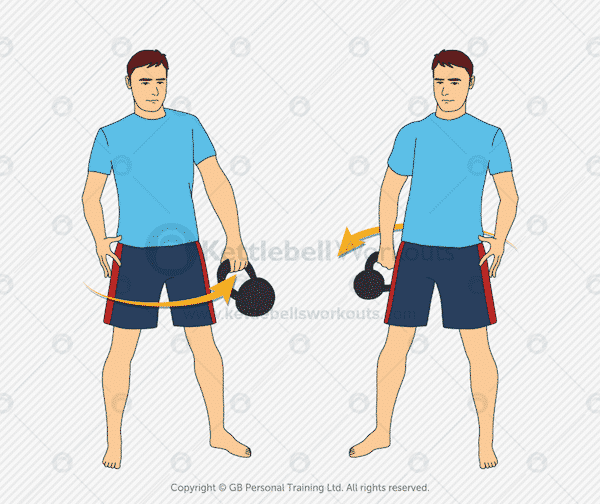 Variations – add further stabilisation challenges by holding different sized kettlebells in the right and left hand. What size KB’s do you recommend? I see you use only 1 -2 different weights. Would it be advantageous to grab a bigger one for Deadlifts (like 60lbs or more) versus doing more reps with a lighter weight? What are your thoughts on that? thanks! Yes you can certainly lift much heavier with the deadlift movement pattern but then you may be stuck when using that kettlebell with other exercises. 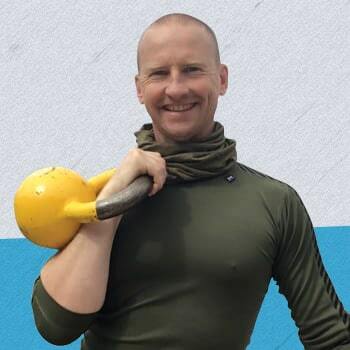 I have a complete article on buying and selecting kettlebells here. These workouts look fun, interesting and challenging. I can’t wait to start using them in my daily workout routine. Thank you!